I haven’t stopped thinking about this poem since the issue arrived. There are several things I loved about it, not the least of which is the topic—a necessary insight given our current political state and the constant outcry for welfare reform. It made me think of a conversation I had with a friend recently who made stereotypical remarks about those on welfare; I read this poem and wanted to send it to her, to help her see more clearly these lives she’s so ready to dismiss as useless and worthless. I also like the way the poem is organized, the hour-by-hour account that forces the reader to wait, along with the others in the lobby, along with the speaker of the poem who is also counting the minutes, to experience and take account of these concrete lives. Valentina has done a superb job of creating and capturing the internal and external atmospherics of the welfare office. She has succeeded in capturing the bleakness and the beauty, the madness and the marvel, the honor in the horror, the extraordinary in the ordinary of these difficult lives. I love how she leads us through these struggles of human existence (which I imagine many of us only know about without really knowing), doling out the day hour by hour, culminating in that wonderful double entendre as she stands on the street corner waiting for the actual and metaphorical light. A masterpiece of observational poetry with a delicious surprise ending. I loved it. Well done! I loved the way Valentina’s choice of words illustrated so poignantly the varying shades and tones of being human. That our lives as we know it are far different from many less fortunate, yet despite this, there is a common thread that ties us all together when we choose to look at the world beyond our own ego—compassion, our greatest gifts as human beings. Love to get inside a world I don’t really know, see the conflict between the speaker and the poor souls trying to survive or pull off a deal. 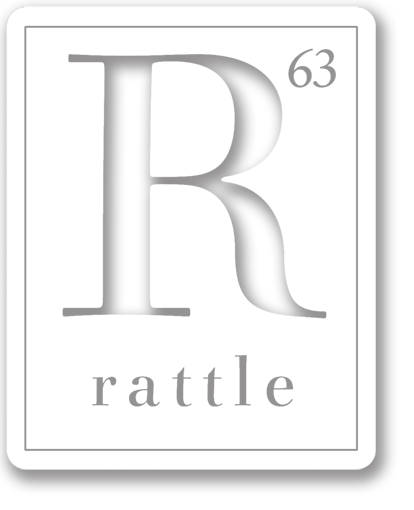 To read the poem, pick up a copy of Rattle #50, or wait until the end of March, when those poems start appearing online at Rattle.com. Many of the poems in the top ten were deeply concerned with the chaos and pain and trouble of the world, but Citro’s poem managed to not only reveal this pain and struggle, but it also looked beyond that. It admitted that the world is full of ‘shrieks,’ but still left me feeling like life was worth living after the pain. Even if ‘it’s so complicated staying alive sometimes.’ Even the moments when Citro’s world is covered in sores, it is still vibrant and full of vital life. Her rhyme and form make it a tingle-inducing crystallization far beyond the rest. About something seemingly ordinary, but in it is the tragedy of mankind—when a self-styled ‘poet’ is closed, and doesn’t ‘know it,’ there’s no more ‘progress’ in any ‘work in progress.’ And the choice of using that poet’s article—removing device in the final two lines of her sonnet—a sharp, brilliant blade where the choice itself replaces a thousand words of discussion. The poem sang with an intensity and tenseness of image, line and repetition building and building image on image of desperation, anger and despair. The very personal made universal and political. This poem struck me for its economy—the ability to say what it needed to say and then stop—and its skill at becoming stronger by pushing against the limits the sonnet creates as a fixed form. Though our young selves refuse to believe that each of us is headed to this same difficult place (‘all are chosen’), the closing lines offer resolution that, while not conveying any false hope, suggest that there is a way to meet the ultimate of what it means to be human, and mortal. “More Than This” was completely unpredictable/surprising, and my emotional response to it became stronger with each reading … a neat trick, because with subsequent readings the complexities of allegory, metaphor, parable (and their subtle distinctions) were also revealed. Usually when I get caught up in craft, emotional resonance takes a back seat, but not with this poem. Plus, I just flat-out love the idea of the false heaven ‘screen(ing) out the folks who’d desert their friends’ and the notion of grief being a shared thing, whether we want it to be or not. Travis took the daily happenings and welded them into meaning: little ‘things,’ big ‘things,’ his ‘things,’ his wife’s ‘things,’ other people’s ‘things.’ His poem was an index card about the ‘trappings’ of everything and how interwoven time, incidents, and everyone’s lives truly are if you allow yourself to reveal the chain. Lovely and a little slam on the head at the same time. Tension is essential to all art, wrote Stanley Kunitz; ‘Deus Ex Machina’ exemplifies this aspect of writing as well as I’ve ever seen in a poem. On the one hand there is the structure of the poem—the meter—which in this case acts as an organizing element for the writer’s thinking, which becomes a step by step accounting that leads to an understanding of the events in the poem. It brings things under control. On the other end of this tension equation is, of course, the totally charged subject, high drama, hope and fear, and moments of utter chaos—the emotional rollercoaster that ensues from watching this scene unfold. In the middle of this linguistic rubber band are the wonderful more-earthy phrasings—the overall tension in miniature—they maintain the meter but burst out with emotion (and act as an emotional release for the writer). A very nice touch is the way the last stanza picks up end rhymes in addition to the meter, signaling, by its more playful nature, a coming-to-resolution for the writer and thus an easing of the tension. Altogether an impressive balancing act. Definitely a winner! What can I say about something as beautiful and powerful as this well written piece. It has form, history, female strength, heartache and love. The repetitive lines only emphasize the meaning, and emotion behind these carefully selected words. This poem will stay with me a long time. I confess that I skimmed much of it the first time; its length daunted me. But this time I just let myself be swept into it, and I think it’s an amazing piece—it covers so much territory, historical, cultural, and, most movingly, emotional. I think it’s an unusually strong example of the particular becoming universal. No such thing happened to me, but I felt drained by the time I’d finished it—as if those words, Somebody shot your daddy, he dead, had actually been said to me, as if my given name weren’t my real name. I can’t pay Patricia Smith and her poem any higher tribute than that—the power of her words lifted me out of a completely other life into her own. And then I thought of ‘Equilibrium,’ of the irony that confronts us, no matter who we are—we know we need to understand the other, yet at the same time we know we need to find who we really are at the core. These two poems—to me equal in their power, in starkly different ways, one by its economy and the other by its profusion of detail—seem to me the heart of a conversation we all need to be having. But even beyond that, Patricia Smith’s poem made me understand something I once heard Jack Gilbert say: We’re all searching for the lost father. Patricia Smith found hers. The power of the poem, the energy and pain so palpable in it, remind me of birth. I can’t imagine asking more, or receiving more, from an elegy.